A consortium led by Bechtel has begun tunnelling on Line 1 of the Riyadh Metro in Saudi Arabia. The Riyadh Metro is set to be the country’s first underground rail system. The Bechtel-led consortium, which includes Saudi company, Almabani General Contractors, Middle East-based Consolidated Contractors Company (CCC), and Germany’s Siemens, is responsible for the US$ 10 billion contract for the design, construction, signaling, electrification and integration of Lines 1 and 2, as well as supplying the metro carriages.. The work includes 39 stations, two of which are key interchange stations: Olaya Station, situated in the centre of Riyadh at the intersection of Lines 1 and 2, and King Abdullah Financial District Station, located slightly to the north on Line 1. He added that tunnelling beneath the Saudi capitals’ streets would prove challenging. “Getting early agreement on the alignment in the heart of the city was crucial to advance the detailed design work needed to start tunnelling. We appreciate the efforts that our client, Arriyadh Development Authority (ADA), and many other stakeholders undertook in helping us achieve this,” said Mr Bangash. The first TBM, Mneefah, named after the horse of Saudi Arabia’s founder King, is expected to steadily ramp up to its planned average tunnelling rate of about 325 ft (100 m) per week and is expected to complete its bore by mid-2016. 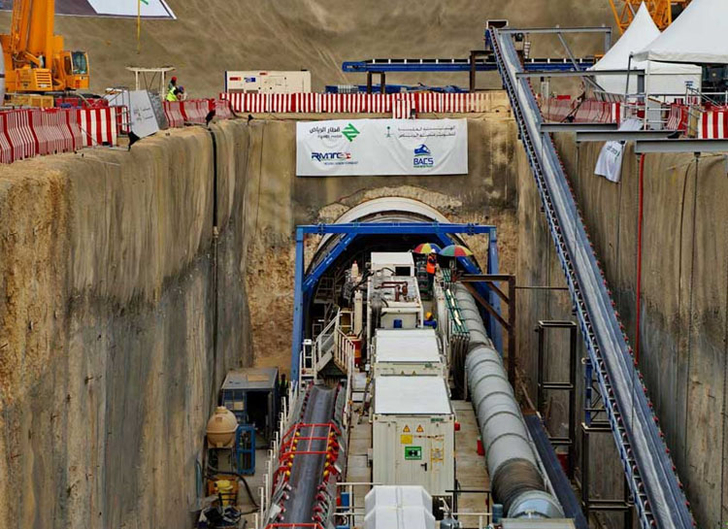 In total, seven tunnel boring machines will be deployed by the Bechtel-led team to dig and construct more than 21 miles (35 km)) of tunnels beneath the capital city.